This Sharp End is from Alpinist 59, which will be available at our online store after August 8 and is available for preorder now. A CHILD STOOD ON A MOUNTAIN PASS at twilight. Alone, he'd hiked up meadows that shimmered ever higher until they vanished into a rose-hued sky. Soon, he was beyond exhaustion; no longer feeling capable of moving his legs, he seemed to float. At the top, a sign read Marmot Pass, 6,000 feet. Before him, the earth descended into darkness. Black silhouettes of mountains smoldered against the last flare of light. He remembered a line from the Kipling poem, Go and look behind the Ranges— / Something lost behind the Ranges. He conjured up old daydreams: the rainforests of the Amazon, the vast icefields of the polar regions, The Roof of the World. But this was something more—he felt as if the reflections of the sunset pierced his bare skin to his soul. Suddenly it came to me that out there in those black peaks under the purple and red and orange and yellow sky, there were no roads at all. This was what they meant by 'wilderness.'... I was all by myself. There was no sound except the river, way down below in the night. There was no wind, everything was as still as in a painting, and me too. The flowers and rocks and grass had the colors of the sky. Night was coming up from the valley. I felt like somebody not me, some character in a fairy tale, under some kind of spell. FOR HARVEY MANNING, that impression of being spellbound by the wild lasted from that Boy Scout trip until his death in 2006. He later wrote, "In that 1938 sunset atop the pass, the first sunset of my life I felt were answers—answers to questions I didn't yet know enough to ask." When a doctor told him he had a heart condition that could kill him at any moment, he dedicated himself to living as intensely as possible. As a young mountaineer in the Cascades and the Olympics, he wandered over isolated summits and through roadless valleys, sensing, again and again, glimmers of that mysterious inner realm. Once, he lost his footing and fell for hundreds of feet down a glacier until all he heard were the notes of unseen water. "Life—abundant, exuberant, transcendent," he concluded upon his survival. "That's what Marmot Pass was all about." By the 1950s, he grew keenly aware that mining and logging companies were tearing away at the edges of these ranges. He began composing articles and guidebooks to convey the beauty of the hills and thus enlist his readers in the protection of wild lands. 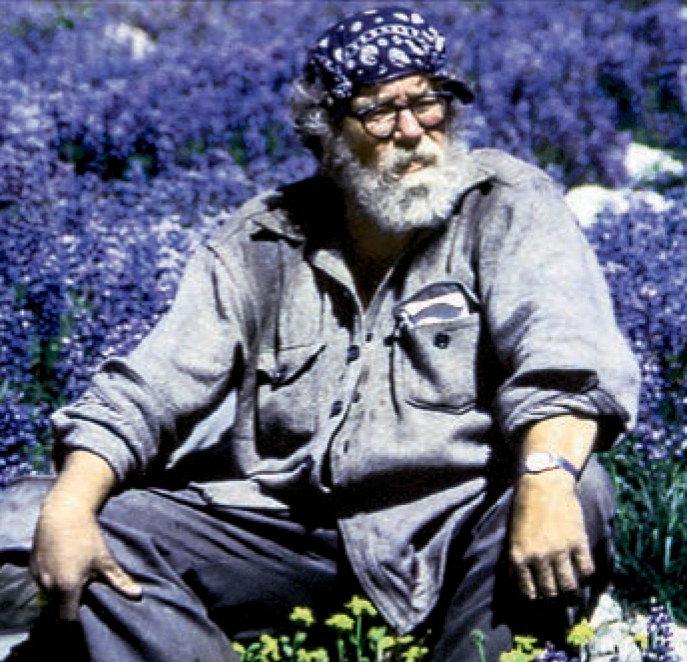 His public advocacy helped lead to the creation of North Cascades National Park and the passage of the Washington State Wilderness Act. In his private life, Manning also created more whimsical story maps, including a series of elaborate hoaxes published under pseudonyms—intended, seemingly, to bewilder and to prod climbers to see the mountains in unfamiliar, deeper ways. I'D FIRST LEARNED of Harvey Manning as one of the perpetrators of the "Riesenstein Hoax" of 1962. 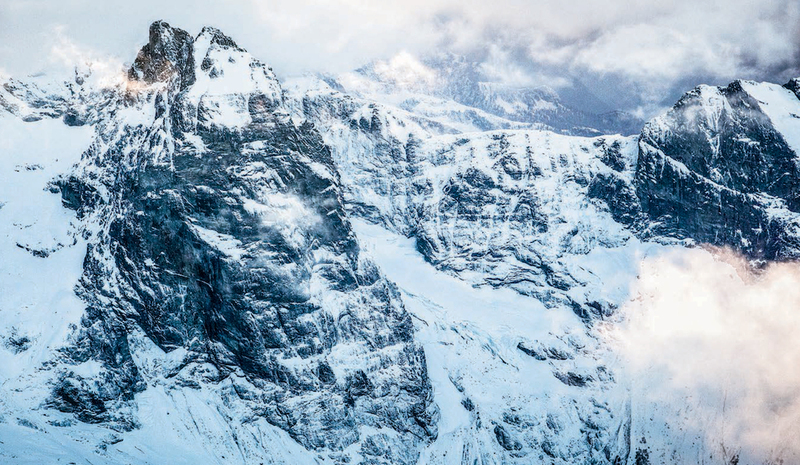 After a flight over the inner ranges of Alaska, Austin Post brought back photos of surreal rock spires that, it seemed, no climbers had yet visited. His friends Manning and Edward LaChappelle wrote a fictitious story about the remote "Riesenstein Peaks of British Columbia." Perplexed, the editors of Summit published it as if it were a true account, luring readers with route lines of failed attempts and a hand-sketched map that read UNEXPLORED. It took years for a few climbers to realize that these peaks were actually the Kichatna Spires and to mount their first expeditions there. Ever since I read about the anecdote in Andy Selters' Ways to the Sky, I've become a seeker of imaginary ranges, curious to understand the reasons for their persistent appeal. This January, while gathering stories about the Riesenstein, I spoke with one of Manning's friends, Dale Cole, who recounted the creation of an earlier fictitious mountain with the beguiling name of "No Name Peak." IN 1959 MANNING AND HIS CLIMBING PARTNERS sat by a large campfire on the edge of a glacier. Before them, the east face of Southeast Mox arched like an otherworldly castle tower. It was hard to imagine that anyone could climb its steep and twisted grey stone. They were deep in a region of the North Cascades that few mountaineers visited, concealed behind dense forests and tangled brush. The indomitable Fred Beckey had been on the summit of course—he'd been nearly everywhere. In 1941, when he made the twenty-three-mile approach with his brother, Helmy, the peak didn't yet appear on his maps. It looked "spectral" to him, surrounded by black clouds and serpentine mists. "A climber's dream, waiting to be made real, to be conquered," he described it in Challenge of the North Cascades. But even after he'd climbed the crumbling stone of its airy northwest face, the peak still seemed like a shadowy nightmare. Now, while the sun set behind the spire, Manning began to talk about the changes he'd noticed with the rise of the outdoor industry in the postwar years. As Cole later wrote in a 2006 edition of The Wild Cascades, Manning felt that climbers were forgetting the "true value of the mountains," preoccupying themselves with self-aggrandizing conquests and expensive gear. Some recent journal articles appeared so full of exaggerations that it no longer seemed clear how far their authors were drifting from the facts.... And with that thought, an idea stirred in his mind. "And before I knew it," Cole told me, "he was talking about this imaginary climb going up Mox Peak." Back at Harvey's house on Cougar Mountain, they transformed Southeast Mox into "No Name Peak," and Cole drew dotted lines on a photo of the east face, showing the attempts of a fictitious party. They altered a map, moving the mountain a few miles away from its real location to the headwaters of No Name Creek. Manning fabricated a story about its "discovery," purportedly written by a climber named "Paul Williams" (which was, in fact, the name of his non-climbing father-in-law). Having missed the deadline for the American Alpine Journal, they sent it to Summit. They would play a prank on "competitive peakbaggers," Cole explains, "by sending them looking for things that weren't there." THE STORY, as the imagined Paul Williams told it in the May 1960 issue of Summit, began with an enticing proclamation about the many unclimbed towers still hidden within the trail-less regions of the Northwest forests. According to him, a Forest Service employee named Arthur Short had glimpsed an immense, unfamiliar cliff while fighting a fire near Arctic Creek. Upon his return home to Portland, he persuaded Williams and other friends to follow him back into the woods. Stumbling through rain-soaked brush, they got lost in the mist, and they thought they'd arrived in the wrong place. When the clouds parted, the mysterious peak appeared like an apparition in a fantasy tale. The group reached a high point below the "big bulge" where the east face reared up, too daunting for them to go farther. Nonetheless, they claimed to find solid rock, fissured with cracks for pitons. "Although we did not conquer No Name Peak," Williams concluded, "we are sure that the Great Wall of No Name Peak will eventually be ranked as one of the finest and most difficult climbs in the North Cascades." A month after the publication of the article, the Cascades climber Dee Molenaar wrote to Summit explaining the current name and actual whereabouts of Mox Peaks. When Fred Beckey returned to attempt the fabled east face in 1968, he wrote to Manning with less optimism than the fictional characters had: "No good—bad rock and limit where cracks go." Yet a sense of reality clung to the hoax, and its story remained interwoven with the history of a wall that continued to appear almost mythical: mist-wreathed, hazardous, perhaps forever unclimbable. It took until 2005 for Mike Layton and Erik Wolfe to complete a real first ascent to the top of the east face, over terrifyingly loose, steep and often unprotectable stone—and until 2008 for Rolf Larson and Eric Wehrly to establish a route that continued to the summit of Southeast Mox. In the Northwest Mountaineering Journal, Layton reported encountering a button-head bolt that he assumed to be left by the Williams expedition—as if that attempt had, in fact, taken place. As I continued my research, I found other coincidental details that seemed, strangely, to corroborate the No Name Peak story. 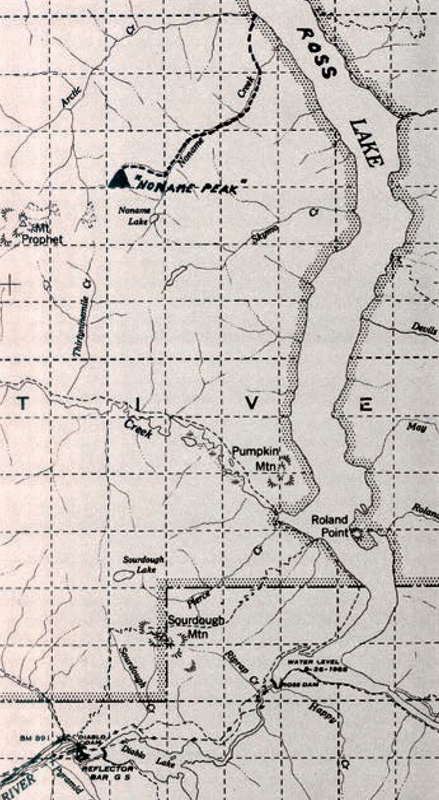 When I sent a copy of the May 1960 Summit article to Mike Layton, he responded, "The topo on the hoax looks remarkably similar to the initial portion of our climb (more or less) and their high point is pretty much where we saw the old bolt." On a 2005 CascadeClimbers.com thread about Southeast Mox, someone posted, "The Paul Williams mentioned in the article is my father-in-law." This real Paul Williams, I learned, had been an active Cascades climber around 1958, a founding member of Seattle Mountain Rescue. He appeared, at first glance, like someone who resembled the protagonist of the quest: an ardent conservationist himself, he had once led an Arctic expedition to look for signs of John Franklin's party (vanished during a search for the Northwest Passage) and guided a group of clients who hoped to find traces of Noah's Ark on Mt. Ararat. Paul Williams' son, Brian, assured me that his father couldn't have been involved in the No Name Peak story: he was not from Portland, and he had no climbing partners with the names of the characters in the Summit article. So, whose traces were found on Southeast Mox? Were they from Beckey in 1968? Or from someone else? In a 1964 satirical article in The Mountaineer, a certain "H. Hawthorne Manning" slyly expressed his pity for overworked editors who struggle to find the truth behind hoaxes such as "the 'No Name Peak' fraud" and the "'Reisensteins' [sic] disgrace.... Fact and fiction read the same in print." After I'd emailed many Cascades climbers, Alan Kearney suggested that I ask Alex Bertulis, who told me that he and Scott Davis might have left that bolt as they retreated during "inclement weather" in the 1980s. I find myself imagining that Manning might have quietly laughed if he'd known that we were still talking about the mystery after all these decades. AND THERE ARE STILL MORE ENIGMAS that remain unsolved. When Manning died in 2006, he left behind stacks of unpublished manuscripts, with stories of other hidden ranges along the borders of reality, fantasy and dreams. In one such narrative, he described a character who "was given a map by a dying prospector and followed it to a cave whose walls and floor and ceiling were glittering crystal quartz veined with eighteen-carat gold." Manning's daughter Claudia recalls a hike that they took near Snoqualmie Pass, when she was young. The sun beat down on them as they walked along a logging road, past stumps of trees, and then up a steep mountainside. "I just turned to Daddy at one point and I said, 'You know, Daddy, you get no place exploring.' He thought that was so funny. When we got to the top of the peak and then there was this lake below that wasn't on any map.... He said, 'See, Claudia, you do get places going exploring." I'm intrigued by the idea of experiencing "no place" as a "place." Perhaps by slipping the bounds of ordinary cartography, we start to glimpse something elsewhere—that "deep wilderness" that Manning's son Paul says his father sought, a realm found only when you get truly lost. Over time, Manning lost interest in climbing to summits, and he began to explore the flanks and bases of mountains instead, searching for unnoticed cols and valleys, finding areas of overwhelming wonders that he kept secret or deliberately obscured in his books. In his journals he noted the flowers he saw, along with other marks. "The little Xs were the places where his heart had a murmur," Paul says. "He marked them down every day of his life." Ever conscious of the possibility of death, among his many imaginings of the wild, Manning had also created a map of the human heart. "SO, DID I EVER FEEL any remorse about any of this?" Cole said to me as we talked about No Name Peak. "Of course not. In fact, as I look back at that time, it really provides some wonderful memories." Today, in our era of pernicious "fake news," Manning's hoaxes have an aura of innocence. Ultimately, the climbers he lured to the "Great Wall of No Name Peak" received, in return, an unforgettable experience of the wild. Mike Layton recalled a sense of good fortune at his part in the history, the chance to be immersed in "the excitement of adventure, the beauty of such a remote area and the camaraderie of friendship." Something else might still arise from the story: a reminder of the need to question our preconceptions about the objective truth or completeness of maps, both physical and symbolic, to search for what lies in the gaps between what is represented and what is not. In Mapping Men and Empire, Richard Phillips pointed out the often unfulfilled potential for the "geography of adventure" to become "spaces of resistance," settings for the transgression of "boundaries and conventions" and for the expression of ideas that might otherwise be suppressed. To do so, we have to broaden our gaze to different kinds of cartographies: from those of the original inhabitants to the diverse ways that individuals encounter a landscape. "There are many varieties of wilderness experience," Manning wrote in The Wild Cascades: Forgotten Parkland. Yet, he added, each one supports the need for such public lands to remains "undiminished." SOME NIGHTS when he felt like reminiscing, Manning said to Cole, "Let's look into the pewter pot," and they'd head down to the basement of Manning's house to drink his homebrewed beer. It was still a little green and it tasted like yeast, but they drank and talked all night about mountains, memories and dreams. Imaginary ranges invite us "to see the world as it is not." But they could also show us how the world could be.